ESRM has grown to about 200 majors as we start this Fall 2018 semester. That’s crazy given that our size was in the dozens only a few short years ago! With this growth has come a ton of cool new opportunities. But there are also the inevitable growing pains. And while you don’t need to hear it from us, those pains include have a gazillion students trying to get into classes that used to hold every interested students with room to spare only a year or two ago. We know that some classes (like Conservation Biology and Land Use) are bursting at the seams with substantial wait lists to boot. ESRM is trying to better wrap our heads around this growth and offer the courses and number of sections you all need to graduate on time. In that vein, we need some clearer data to help us respond to your expanding needs. Please take a moment to fill out BOTH these short surveys. 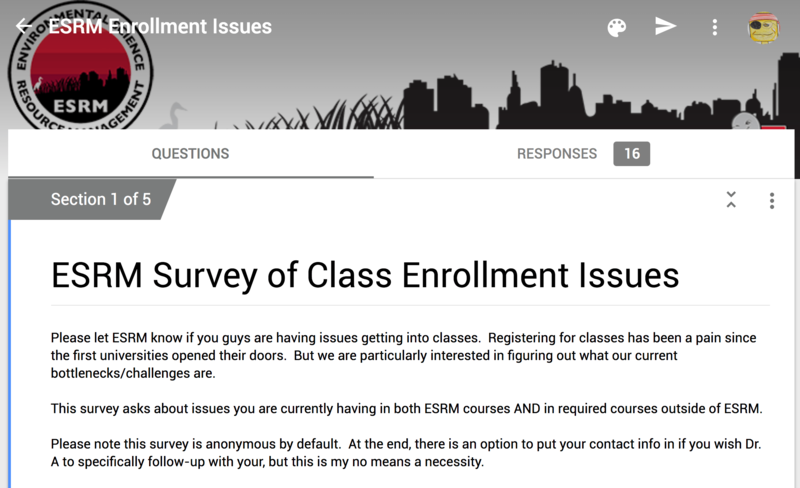 Our first survey is an opportunity for you to tell us about the specific course enrollment problems you are having RIGHT NOW. Our second survey should be completed by EVERYONE. As we work to adjust our course offerings for next semester, we want to make sure that we meet as many of your needs as we can (budget permitting). Please tell us which courses your would LIKE to take and which ones you absolutely MUST take next semester to stay on your individual path to graduation. You aren’t tied to this and we know that plans change, but your wishes and needs will really help us make sure we do everything we can to keep you on track as we plan our Spring 2019 course offerings.